As a blogger, I always try to grab premium products for free or at least at minimum cost. Recently I wrote a WPForms Contact Form WordPress Plugin review post. The tool easy to setup and configure. A powerful drag and drop form builder WordPress plugin. Bundles all the basic and advanced features to create a simple form to even more advanced booking, registration, surveys and polls form. 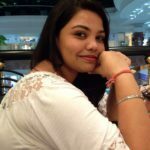 Bundles all the basic and advanced features to create a simple contact form, advanced bookings, form pages to create custom landing pages, registrations, payment request, surveys and polls form. 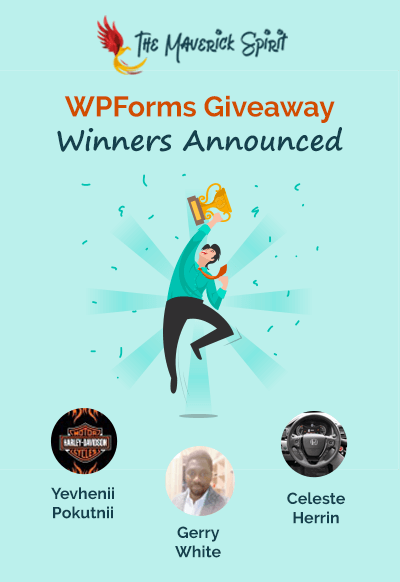 Well, that’s when I decided to partner up with WPForms to give my website audience an opportunity to win WPForms Pro License to 3 lucky readers. Winners will be announced on Friday, March 20th, 2019. 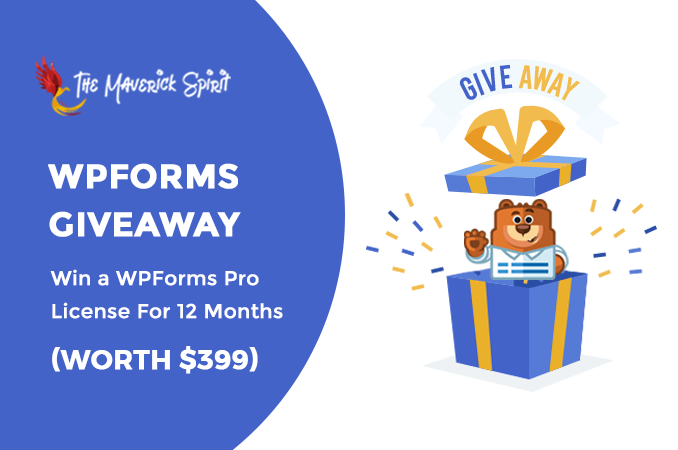 But before proceeding on – How to enter WPForms Giveaway? WPForms is a Drag-and-Drop WordPress form builder plugin that allows you to create beautiful and powerful forms quickly. You can read out the complete list of features in detail in my WPForms Review post. 3 lucky readers of our website will win the pro license of WPForms Drag & Drop WordPress Contact Form Builder Plugin. WPForms Pro license costs $399/year, but we will be giving it to you for FREE. How To Enter & Win The Giveaway? Login with Facebook or enter your email in the form below. Complete all tasks to collect as many points as you can and increase your chances of winning. At last, Comment down in the post. What If I Don’t Win? But wait, there’s more! Even if you don’t win the contest, we still have an exclusive WPForms 50% OFF discount coupon code for all the participants of this giveaway. You can purchase WPForms for exactly half the price. Email us at – admin[at]themaverickspirit[dot]com to know the coupon code. How Winners Will Be Chosen And When? Winners will be chosen randomly using the Rafflecopter widget on the basis of highest points. We will announce the winners on March 20th, 2019 via email and also we will be posting out the names here. Thank you for following TheMaverickSpirit. 5+ Instagram Mistakes To Avoid By Graphic Designers! January Monthly Update Report  Traffic Boost by 21% & Blogger Outreach! Thanks for sharing. Hope I win this! Wow… This is great giveaway. This plugin seems very useful. Thanks. At least, I can add some plugin to my blog to make it look fancy.